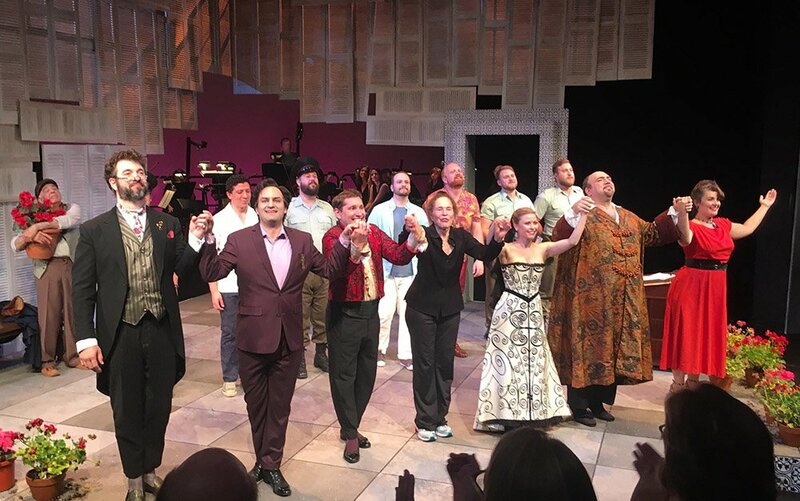 Music Director Susan Davenny Wyner and the Boston Midsummer Opera brought Rossini’s great comic opera, The Barber of Seville, to Watertown yesterday with terrific singing, great acting, masterful stage direction, and an excellent orchestra. Go see it Friday or Sunday! It started with Pierre-Augustin Caron, later Caron de Beaumarchais, the French polymath whose claim to fame until 1767 was the invention of an improved escapement mechanism for pocket watches. He is now best known for his trilogy of plays, Le Barbier de Séville ou la Précaution inutile, La Folle Journée, ou Le Mariage de Figaro and L’autre Tartuffe, ou La Mère coupable. Mozart’s and Rossini’s are merely the most popular of a great many operatic settings. The intimacy of the Mosesian Center allowed Director Ocampo-Guzman to stage close interactive engagement. Like Figaro himself, Ocampo-Guzman used intelligence, wit, inventiveness, and boldness masterfully and spontaneously to interweave fireworks and depth. When Figaro (Robert Balonek) burst into the arena with effortless energy and bravado, he shook hands with audience members in the first row and roamed through the aisles greeting people. Count Almaviva (Theo Lebow) and Don Basilio (David Cushing) also ranged freely in the aisles, blurring boundaries and expanding the stage, but also reviving a messy and dangerous pre-modern Sevilla in which men roamed freely and women were kept under lock and key. As though further putting us all on the stage of human plotting and folly, an audience member was enlisted to act as the Notary signing the wedding certificate in the final scene. The “Zitti, zitti, piano piano,” in which Almaviva, Rosina, and Figaro confidently sneak towards the ladder that is no longer there, bumping into each other in their “rush” to escape, struck me as particularly hilarious and successful―a paradoxical Rossini decrescendo in its own right ― revealing youthful desire and idealism as the elemental sources of emancipation and resources of human providence. Similarly, Lebow’s rendering of the immensely difficult final aria Ah, il più lieto with its staccato-tremolo succeeded in adding yet a new color of triumphant youthful idealism over a dysfunctional status quo, affirming how an active embrace of carnavalesque self-invention can be a form of resistance through which to exorcise demons from a repressive society. Perfect review. One problem. Barbiere is Pretty much sold out. If readers wish tickets, hop to it. Right on on the careful preparatory work of director Ocsmpo-Guzman. It showed. Rosina’s voice was exquisite, her diction clear, and her complex character marvellously portrayed. The voice of Count Almaviva (Theo Lebow) was also luscious. An added comic treat was the aged, plodding, taciturn and deliberately oblivious gardener of Yehudi Wyner. It parried well with the complex emotions of the plot. Thank you, Bettina. I could have gone on at length about everyone involved in this production. They all contributed! Robert Balonek as Figaro deserved more praise – his great voice and infectious energy were vital here; both David Cushing as Basilio and Heather Gallagher as Berta were excellent; and Susan Davenny Wyner conducted the fine group of musicians perfectly, supporting and enhancing the singers; the entire supporting ensemble were spot on as well. It all has to come together for the production to succeed, and in this case it sure did. The star of the show was David Cushing as Don Basilio. I should like to hear him as Don Giovanni. No, the star was Robert Balonek. He should be singing Figaro or Lepporello at the Met. But every singer in that production could be given the first star! However, David Cushing (Basilio) was a “problem” on Sunday in that his great voice was several decibels louder than every other voice — perhaps he should have been advised that his volume level should be saved for a larger hall — where he would indeed make a great Don.